The Times newspaper archive is now online and features "200 years of history as it appeared in the original pages of the Times Newspaper 1785-1985." Every available issue has been fully scanned and is digitally searchable. Easy navigation and the ability to print, save and email are also useful features. 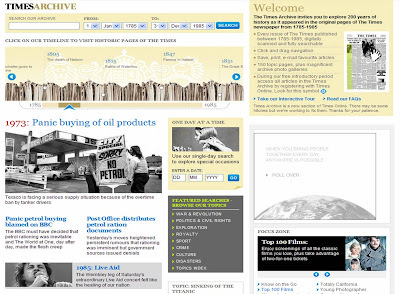 The homepage is at http://www.timesonline.co.uk/archive and is free to access once registration has been completed. It is then possible to click the desired article and read / save / email the editorial piece. I found a report for the UEFA Cup match that finished Levski Spartak 1 Watford 3! 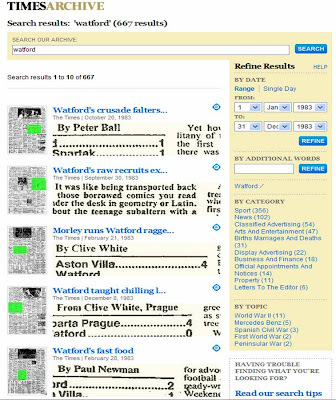 The Times Newspaper Archive Online is remarkable. The editorial depth is fantastic and it is really easy to use - a truly amazing project!